From all of us here at LibraryThing, we hope you have a wonderful set of holidays, whatever they may be. 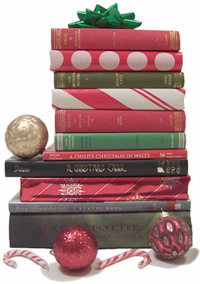 Many thanks to all who participated in SantaThing, for bringing new books into a fellow LibraryThing member’s home. The SantaThing page is open, so each participant can see who their Secret Santa was, and any suggestions. Underwaterguy and I have just cracked our new books (thanks, Moomin_Mama and strongstuff). We plan on having a very reading day. Note from Tim: Many thanks to Sonya and Abby (and Sara!) for doing 95% of the SantaThing work. The ordering was a little easier this year, but there were more Santas—over 370. Last Wednesday John brought live two new database servers, Alexander and Hannibal*. Together, they more than doubled our database heft. Put another way, our servers, which were operating at near full capacity all day long, can finally rest a bit. They can do everything as fast as they’re able, unencumbered by unsupportable amounts of work. Performance. The effect on site performance has been positive. But problems remain. Profile pages are dramatically faster. Author, work, subject are faster and no longer slow down at peak times. Talk pages are essentially unchanged. The future. We will continue to improve. Until Wednesday the situation was desperate. When a box got behind, we had to turn off access to interior pages to all but signed-in members. That day is over, thank God**. And we can finally tease apart what was is itself slow, versus what was just slow because everything else was slowing it down. Lastly, John has long wanted to try out some low-level tweaks, but with no spare capacity, couldn’t. I expect he will find ways to wring more out of what we have. Whether he can or not, we are going to keep improving. We have laid aside the money to buy a number of other servers—up to ten, if needed. One or two will be database servers, probably removing administration and caching traffic from the live servers. A number will be memory machines—low-end boxes with tiny disk drives and obscene amounts of RAM. They’ll help us use memory caching more effectively, reducing database load. The balance will be tasked in other ways—supporting LibraryThing for Libraries, serving secondary resources (covers, APIs, widgets) and providing redundancy, so we won’t be skating along a cliff anymore. Thanks to John for getting the new servers racked and running. Thanks to the members for hanging in with us as we grow, and grew and grew! *Yes, I named them. Cliche, I know. But Alexander was my research interest in grad school, so I’m allowed! Anyway, at least they’re consistent, and set a pattern we can follow (next up, Mithridates and Shapur). I’m still bothered that a previous sysadmin named our twin MyISAM databases Apollo and Athena, not Apollo and Artemis (who were twins). Then there’s Plato and his bigger twin Mongo, which makes no sense, but feels right, and the one everyone hates, our backup machine, Mnemosyne. Abbiamo appena riattivato la possibilità di catalogare libri italiani via DEAstore ( ci scusiamo per il probelma ma DEA stave lanciando una nuova versione del sito con diverse nuove tecnologie). Se non avete ancora aggiunto il DEAstore alle vostre fonti di catalogazione, potete farlo scegliendolo tra le fonti italiane. Se avete già fatto tutti i regali e avete catalogato già tutti i vostri libri, allora vi consiglio un bell’articolo su LibraryThing pubblicato su ApogeOnline da Eleonora. Buona catalogazione e buone feste a tutti voi! … and happy holidays to all the other thingambrarians in the world too! As a special holiday treat, we’ve got an Early Reviewers “bonus batch” for you. Unlike most bonus batches, this only includes one book, *and* it is running at the same time as the regular December batch. What that means for you is that you could potentially win two books this month, since the bonus batch ‘winners’ are picked separately. The book: Random House’s new Modern Library edition of Geoffrey Chaucer’s The Canterbury Tales. It’s a new complete and unabridged translation by Burton Raffel with an introduction by John Miles Foley. NPR’s “Weekend All Things Considered” did an interview with the translator, Burton Raffel, a few weeks ago, The Art of Translation, if you’re interested. Only fifteen copies are available, and only to residents of the US. Go request it if you’re interested! You have until the end of the month. UPDATE: SantaThing Santas have been picked! Go to SantaThing to find out who you’re giving books to! PLEASE NOTE: You only have until Friday (the 19th) at 10pm Eastern Standard Time (3am GMT) to pick gifts. Although we were going to end sign-up for SantaThing at noon today (aka, now), we’ve decided to extend it for a few hours. So you now have until 4pm Eastern today to sign up for SantaThing! We already have over 300 members signed up to participate, and tons of helpful suggestions posted! If you don’t want to be a Santa yourself, you can always help out by looking at the list of Santas and posting book suggestions. Back by popular demand, I hereby announce LibraryThing’s second annual SantaThing! SantaThing is Secret Santa for LibraryThing members. Now, this doesn’t have to be just for you. You can also go in for someone you know—a relative or a friend. Describe their library a bit and someone will find them the perfect present. And you can become a Santa as many times as you like. 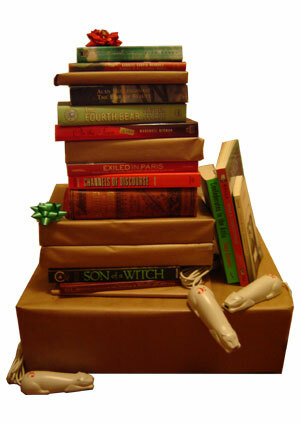 Lastly, even if you don’t want to be a Santa, you can help by suggesting books for others. Crucial dates. This is going to end very soon. Monday, December 15th at 12 Noon Eastern. Santa-signup ends. Shortly thereafter, we will tell you who you are matched up with. Then you go crazy trying to find the perfect books to give them. Friday, December 19th at 10pm Eastern. Submit gifts to LibraryThing. LibraryThing buys everything. Questions? Ask them in this Talk topic. Unfortunately, for various reasons, this is only open to people with addresses in the US, Canada, or Britain. The December batch of Early Reviewer books is up! We’ve got 71 books this month, and a grand total 1,445 copies to give out. The deadline to request a copy is the end of the month— December 31st at 6pm EST. Eligiblity: Publishers do things country-by-country. This month we have publishers who can send books to US, Canada, the UK, Australia, France, Germany, and Israel. Make sure to check the flags by each book to see if it can be sent to your country.